As promised, here's the second post in MBE's series about ALDI, the trend-setting grocery chain making waves in Southern California. 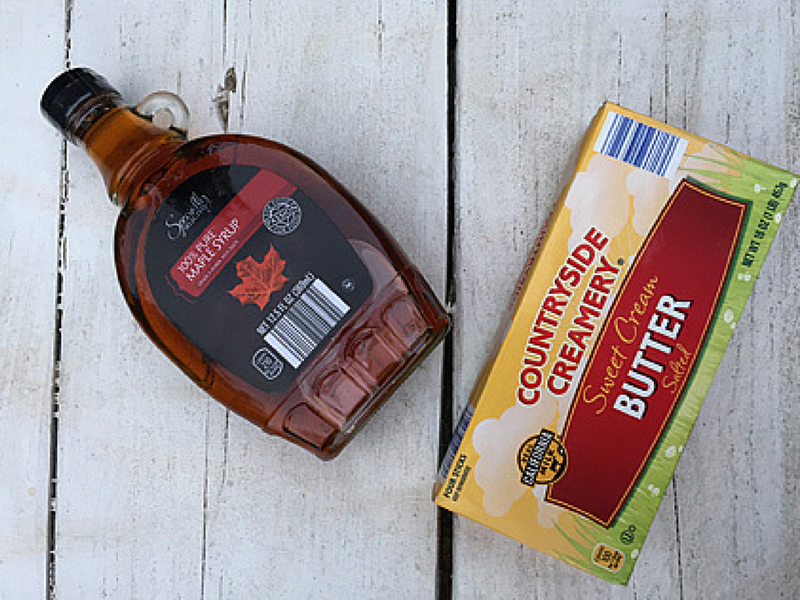 Last time I reflected on my first experience shopping here and what makes this grocery store with budget-priced quality products so unique. 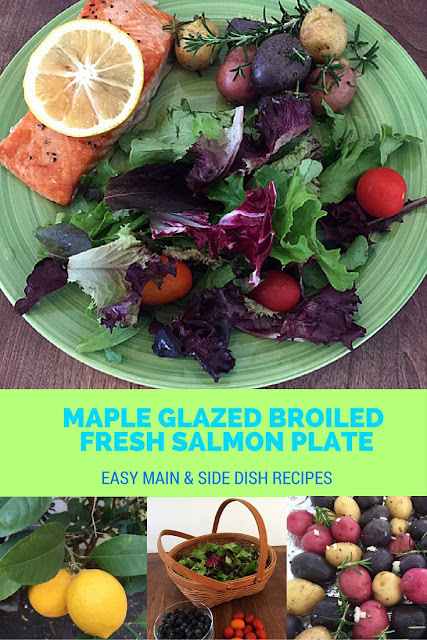 Now, I'm pleased to have the opportunity to share my original recipes for an easy 3-course meal centered around the Maple Glazed Broiled Fresh Salmon I prepared for my family. Made exclusively with fresh and bakery items purchased at ALDI, this freshly-prepared, colorful and delicious menu costs less than $7 per person, including dessert. 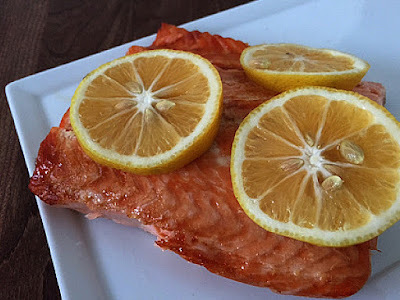 Starting with fresh salmon which has not been previously frozen is key to making what my husband and kids all say is the best fish dish they've ever tasted at a restaurant or at home. It's surprisingly easy and fast to make, involving a handful of ingredients all of which can be picked up at your local ALDI supermarket. Fresh Atlantic Salmon Fillets, approximately 3 lbs. 2. To minimize sticking, cover cookie sheet w/ foil, then lightly spray pan. 3. Place all salmon fillets in pan with skin side facing down. 4. 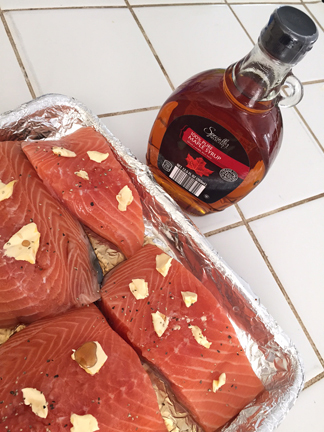 Dot with butter, then drizzle maple syrup over each piece of fish. Sprinkle lightly with salt and pepper to taste. 5. Place pan on rack in the top 1/3 of the oven and brown by broiling, watching carefully as cooking time can vary from 10-18 minutes. Do not turn fish over. 6. 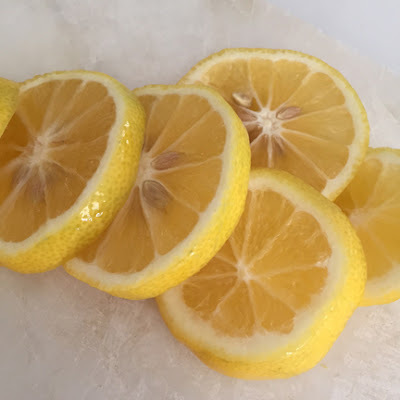 Serve hot, warm or cold with fresh, sliced lemons for color and added flavor. 1. 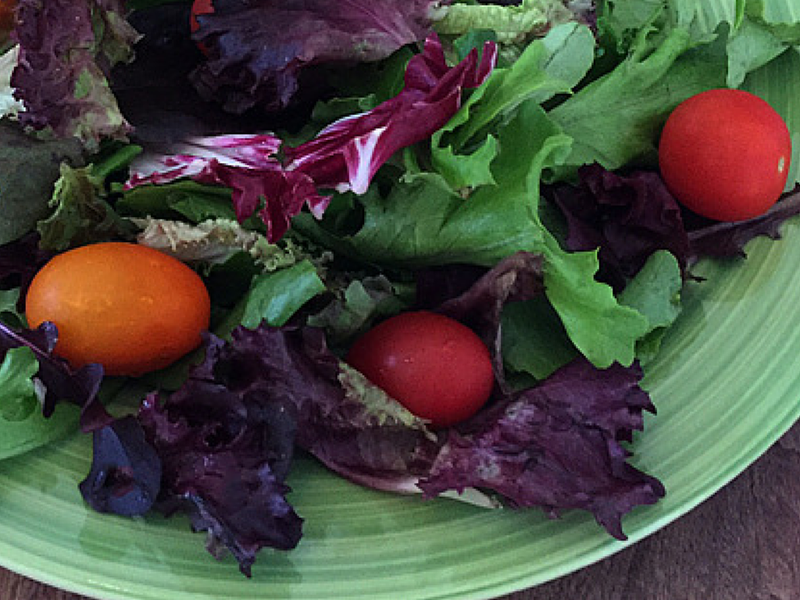 Simply empty the greens into a salad bowl and top with desired amount of tomatoes. 2. Add salt, pepper and a fresh squeezed lemon juice to taste and your salad is ready to serve. 1. Wash fresh potatoes and place whole in bowl. 2. Add Mince Fresh Garlic (or Garlic Powder) and Salt & Pepper to taste. 3. Spray potatoes in bowl lightly and toss. 4. Bake in pre-heated oven at 400 degrees for 50-60 minutes until potatoes lightly roasted and pierce easily with a fork but are not mushy. 5. 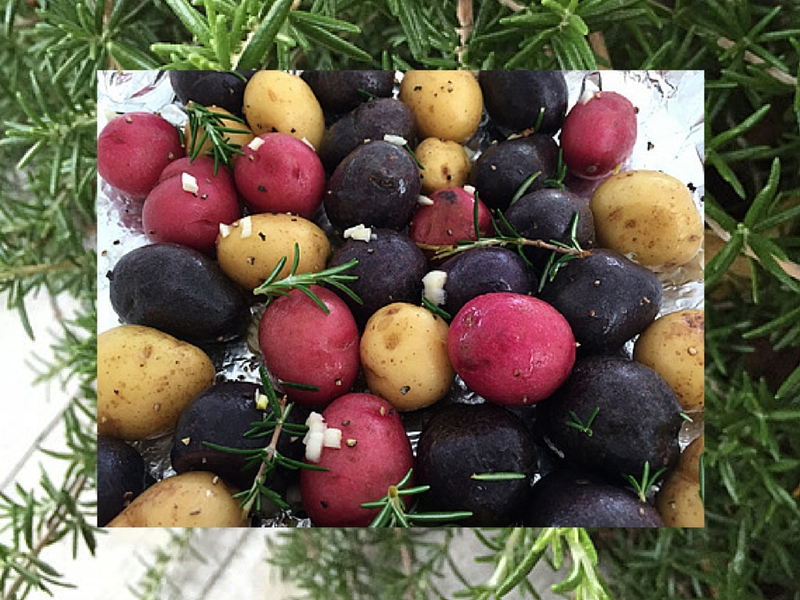 Garnish with fresh parsley from ALDI or as I did with sprigs of fresh rosemary from my backyard garden. 6. 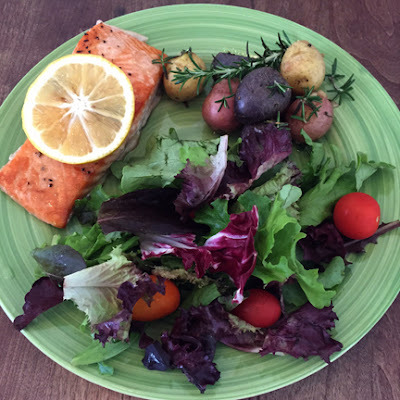 Serve and enjoy hot with the Organic Mixed Greens & Multicolor Salad, alongside the Maple Glazed Broiled Salmon. 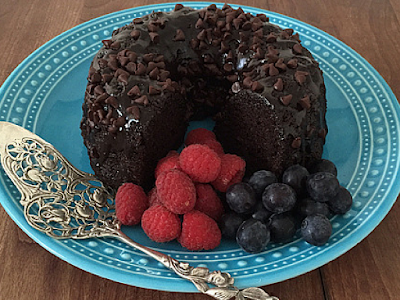 Finish off your meal with a slice of freshly baked and moist chocolate cake that is so good and beautiful they'll think it's homemade. Eat it straight out of the box or as I've done, serve with fresh raspberries and blueberries. 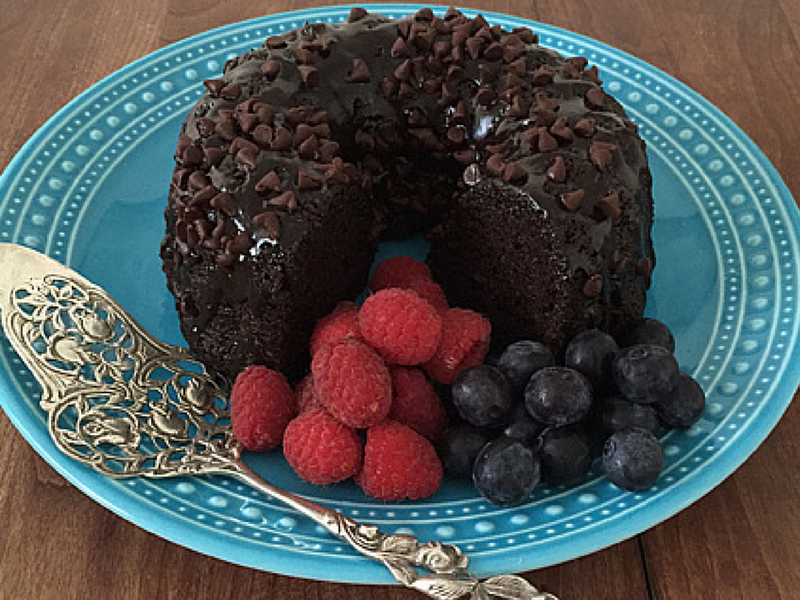 The amazing cake is available exclusively at ALDI, this can be your little secret, with just 230 calories per slice and priced at only $2.99 for the whole 20 ounce cake. 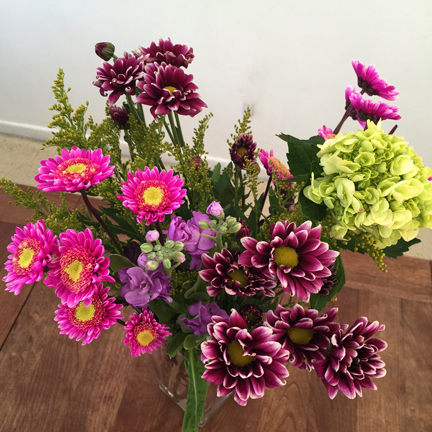 This fresh, summery bouquet was just $4.49. So, don't forget the flowers at ALDI when you shop for all the ingredients to make this delicious meal for family or friends. Learn more about ALDI, this week's special promotions, and find the store nearest you by visiting the brand's official website. You can also keep up to date on everything this leading grocery retailer is doing by following the brand on Facebook, Instagram, Twitter and the ALDI Blog. Meanwhile... find an ALDI store within 30 minutes of where many SoCal celebrities work and live. FTC Disclosure: This post was sponsored by ALDI as part of Influencer Activation for Influence Central. However opinions here are our own. See complete FTC Disclosure that appears at the bottom of MBE's home page and at the bottom of every individual post including this one. Salmon is so delicious. I am always looking for new recipes to try. I will have to give this one a go this weekend. I am not a fan of salmon, but I could probably eat it cooked like this. Looks very delicious and Aldi is my goto grocery store. I like the way you gave us a recipe for an entire dinner not just the main entree. Everything looks and sounds so delicious. I've never broiled salmon before! I will have to try that. Love this whole dinner idea! Everything seems so fresh!